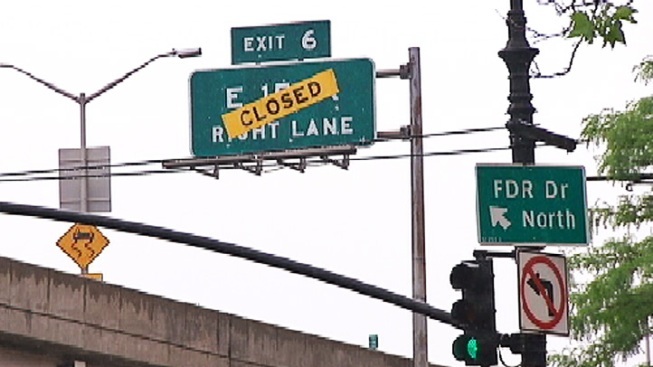 Since 2002, FDR Drive's Exit 6 Mysteriously Says "Closed"
An exit ramp off the FDR Drive has been inaccessible for nearly 12 years, but the yellow signs on Exit 6 simply read "Closed," leading some to believe it could someday open again. But drivers who have wondered about the signage since 2002 should count on the exit staying sealed off. The exit, which used to allow southbound drivers within a few feet of a vital Con Edison substation before shooting them out at 15th Street, was shut down for security reasons after 9/11. And Police Commissioner Ray Kelly said that shouldn't change. “There’s no reason to open it up,” said Kelly. The substation is the same power hub that suffered extensive damage during Hurricane Sandy, leaving hundreds of thousands of people in the dark. "This is a very critical piece of infrastructure,” said Con Edison CEO Kevin Burke, who said major upgrades have been made to prevent floods and fires since Sandy. Commuters and residents who travel the FDR have differing views about the exit. The "Closed" signs are slapped across the exit signs, giving them a more temporary feel. “I think it should be reopened,” said John Ciccotelli of Gramercy, who estimates he’s passed the exit 60 times wishing he could have departed the FDR in the East Village. But Anne Notaro, who lives in the area, said: “Leave it closed. What’s the difference?” She wonders if removing the exit signs might lead to even more driver confusion. And Ronald Yevdayev, a limo driver, said the closure has cost him time and money as trips to the Village require getting off at Houston Street, then looping back uptown. "Many customers want to get on 14th Street," he said. "If 15th street is open, it will be much easier." The NYPD indicated the "Closed" signs might not be helping much at this point. "Probably the signs should go down, probably just an oversight," said Kelly. The Department of Transportation, which determines what road signs say and when they’re replaced, said it was looking into possibly removing the signs.